Well, I think canoeing can be very romantic, don’t you. Our guest love to canoe the Pecan Bayou. The slow moving waters make it an easy paddle upstream or down. The abundant wildlife and birds all along the trail make for great viewing as you paddle. 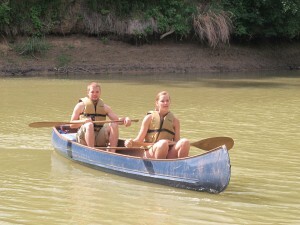 Most couples that choose our package have canoed at least once, but some have never in their lives. So, for them, we give a brief lesson on paddling and who’s in charge of steering the boat. If you love outdoors and being together, then you should come try the Pecan Bayou. I think the cutest most romantic couple we ever had, was a couple from Austin. He got in the back and ready to go, she got in, but turned and faced him, laid the paddle in the bottom of the boat and opened up a pretty white lace parasol and was ready to go. Of course, I did not have camera ready for that shot of a life time. Just spending time on the water paddling to me is very romantic and love to do it with Don as much as we can. And, we plan on it this week. Come enjoy some nature and romantic time on the water. So, here’s a secret for you, The Pecan Bayou has been approved for a Texas Paddling Trail, we are just finishing up all the details with Texas Parks & Wildlife to make it public, so you get to know before anyone else.